(a) National income rises and the private surplus moves from 4 per cent of GDP to 6 per cent of GDP. (b) National income remains unchanged and the private surplus moves from 4 per cent of GDP to 6 per cent of GDP. (c) National income falls and the private surplus moves from 4 per cent of GDP to 6 per cent of GDP. (d) National income rises and the private surplus moves from 0 per cent of GDP to 2 per cent of GDP. (f) National income falls and the private surplus moves from 0 per cent of GDP to 2 per cent of GDP. The answer is Option (d) National income rises and the private surplus moves from 0 per cent of GDP to 2 per cent of GDP. Thus, when an external deficit (X – M < 0) and public surplus (G – T < 0) coincide, there must be a private domestic deficit. While private spending can persist for a time under these conditions using the net savings of the external sector, the private sector becomes increasingly indebted in the process. Consider the following graph and accompanying table which depicts two periods outlined in the question. In Period 1, with an external surplus of 2 per cent of GDP and a fiscal surplus of 2 per cent of GDP the private domestic balance is zero. The demand injection from the external sector is exactly offset by the demand drain (the fiscal drag) coming from the fiscal balance and so the private sector can neither net save or spend more than they earn. 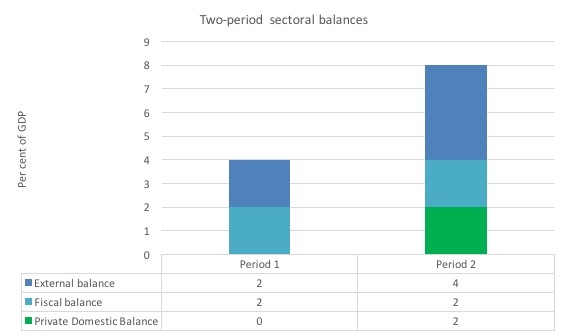 In Period 2, with the external sector adding more to demand now – surplus equal to 4 per cent of GDP and the fiscal balance unchanged (this is stylised – in the real world the fiscal balance will certainly change), there is a stimulus to spending and national income would rise. The rising national income also provides the capacity for the private sector to save overall and so they can now save 2 per cent of GDP. The fiscal drag is overwhelmed by the rising net exports. If the drain on spending (from the public sector) is more than offset by an external demand injection, then GDP rises and the private sector overall saving increases. If the drain on spending from fsical policy outweighs the external injections into the spending stream then GDP falls (or growth is reduced) and the overall private balance would fall into deficit. A rising fiscal deficit tells us that the government is pursuing an increasingly expansionary fiscal stance. The problem is then how to determine whether the chosen discretionary fiscal stance is adding to demand (expansionary) or reducing demand (contractionary). It is a problem because a government could be run a contractionary policy by choice but the automatic stabilisers are so strong that the fiscal balance goes into deficit which might lead people to think the ‘government’ is expanding the economy. The estimated NAIRU (it is not observed) became the standard measure of full capacity utilisation. If the economy is running an unemployment equal to the estimated NAIRU then mainstream economists concluded that the economy is at full capacity. Of course, they kept changing their estimates of the NAIRU which were in turn accompanied by huge standard errors. These error bands in the estimates meant their calculated NAIRUs might vary between 3 and 13 per cent in some studies which made the concept useless for policy purposes. So in terms of the question, a rising fiscal deficit can accompany a contractionary fiscal position if the cuts in the discretionary net spending leads to a decline in economic growth and the automatic stabilisers then drive the cyclical component higher and more than offset the discretionary component. Matching government deficit spending with bond issues is less expansionary than if the government instructed the central bank to buy its bonds to match the deficit. There are two dimensions to this question: (a) the impacts in the real economy; and (b) the monetary operations involved. So while the composition of output might change (workers would be shifted between the consumption goods sector to the capital goods sector), a full employment equilibrium was always maintained as long as price flexibility was not impeded. The interest rate became the vehicle to mediate saving and investment to ensure that there was never any gluts. This trilogy of blogs will help you understand this if you are new to my blog – Deficit spending 101 – Part 1 – Deficit spending 101 – Part 2 – Deficit spending 101 – Part 3. The basic flaws in the mainstream story are that governments just borrow back the net financial assets that they create when they spend. Its a wash! It is true that the private sector might wish to spread these financial assets across different portfolios. But then the implication is that the private spending component of total demand will rise and there will be a reduced need for net public spending. In terms of the monetary operations involved we note that national governments have cash operating accounts with their central bank. The specific arrangements vary by country but the principle remains the same. When the government spends it debits these accounts and credits various bank accounts within the commercial banking system. Deposits thus show up in a number of commercial banks as a reflection of the spending. It may issue a cheque and post it to someone in the private sector whereupon that person will deposit the cheque at their bank. It is the same effect as if it had have all been done electronically. All the commercial banks maintain reserve accounts with the central bank within their system. These accounts permit reserves to be managed and allows the clearing system to operate smoothly. The rules that operate on these accounts in different countries vary (that is, some nations have minimum reserves others do not etc). For financial stability, these reserve accounts always have to have positive balances at the end of each day, although during the day a particular bank might be in surplus or deficit, depending on the pattern of the cash inflows and outflows. There is no reason to assume that these flows will exactly offset themselves for any particular bank at any particular time. The central bank conducts “operations” to manage the liquidity in the banking system such that short-term interest rates match the official target – which defines the current monetary policy stance. The central bank may: (a) Intervene into the interbank (overnight) money market to manage the daily supply of and demand for reserve funds; (b) buy certain financial assets at discounted rates from commercial banks; and (c) impose penal lending rates on banks who require urgent funds. In practice, most of the liquidity management is achieved through (a). That being said, central bank operations function to offset operating factors in the system by altering the composition of reserves, cash, and securities, and do not alter net financial assets of the non-government sectors. Fiscal policy impacts on bank reserves – government spending (G) adds to reserves and taxes (T) drains them. So on any particular day, if G &GT; T (a fiscal deficit) then reserves are rising overall. Any particular bank might be short of reserves but overall the sum of the bank reserves are in excess. It is in the commercial banks interests to try to eliminate any unneeded reserves each night given they usually earn a non-competitive return. Surplus banks will try to loan their excess reserves on the Interbank market. Some deficit banks will clearly be interested in these loans to shore up their position and avoid going to the discount window that the central bank offers and which is more expensive. The upshot, however, is that the competition between the surplus banks to shed their excess reserves drives the short-term interest rate down. These transactions net to zero (an equal liability and asset are created each time) and so non-government banking system cannot by itself (conducting horizontal transactions between commercial banks – that is, borrowing and lending on the interbank market) eliminate a system-wide excess of reserves that the fiscal deficit created. This is based on the erroneous belief that the banks need deposits and reserves before they can lend. Mainstream macroeconomics wrongly asserts that banks only lend if they have prior reserves. The illusion is that a bank is an institution that accepts deposits to build up reserves and then on-lends them at a margin to make money. The conceptualisation suggests that if it doesn’t have adequate reserves then it cannot lend. So the presupposition is that by adding to bank reserves, quantitative easing will help lending. But this is a completely incorrect depiction of how banks operate. Bank lending is not “reserve constrained”. Banks lend to any credit worthy customer they can find and then worry about their reserve positions afterwards. If they are short of reserves (their reserve accounts have to be in positive balance each day and in some countries central banks require certain ratios to be maintained) then they borrow from each other in the interbank market or, ultimately, they will borrow from the central bank through the so-called discount window. They are reluctant to use the latter facility because it carries a penalty (higher interest cost). So the answer to Question 3 is false as government deficit-spending always create aggregate demand(real-economy) whatever the governmental operations on reserves are! The private sector earns their net-financial assets in both alternatives, right! No alternative is more or less expansionary than the other(no real crowding out-effects). What is different are the monetary outcome on the size of cb-reserves and interest-level policy. Always good to read this stuff, again and again and again…. slowly it sinks in I think – but the tricky questions still challenge you and force you to think coherently – Thanks Bill! An MMT textbook for teens ? Like the book Yanis just realised? I realise this may not be a region you have any expertise in, but it would be interesting to read an MMT commentary on recent events in Argentina, and their turn to the IMF. The reason being it’s the latest example of somewhere where the mainstream story anyway is of a populist government (the previous Kirchner government) spending profligately and storing up trouble for the future with high inflation and a currency crisis. Is the MMT story any different? Perhaps the alternative might be similar to Tony Benn’s plan for the UK in the 70s with capital controls?